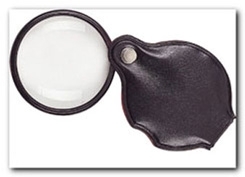 This convenient, pocket-sized magnifier is easy to carry around. Provides 3X magnification with its glass lens. Pouch is vinyl with felt interior and protects lens when not in use. 2" Diameter glass lens.